Don Travis: Finally, to Bisti We Go! I have been promising for weeks to get to the post on Bisti. Actually, I was stalling until I could get in contact with a man who has some fantastic images of the wilderness area. 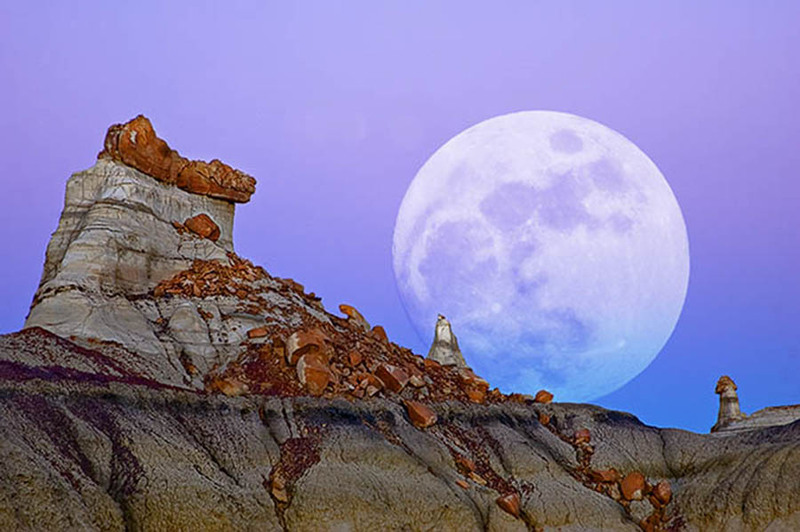 Photo credit for all of the incredible Bisti images in this post goes to my friend and neighbor, Joe Bridwell, Award-Winning Fine Art Photography. 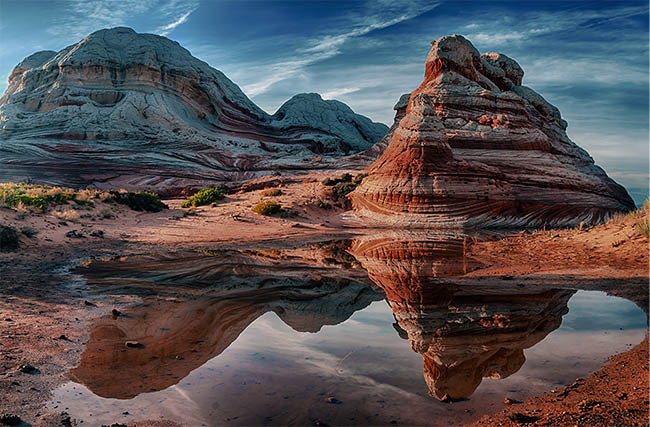 He has something like 10,000 amazing photographs of the southwest and can be contacted at www.BistiArt@Geocompa.com. You should also check out his blog at www.cfam.geocompa.com. 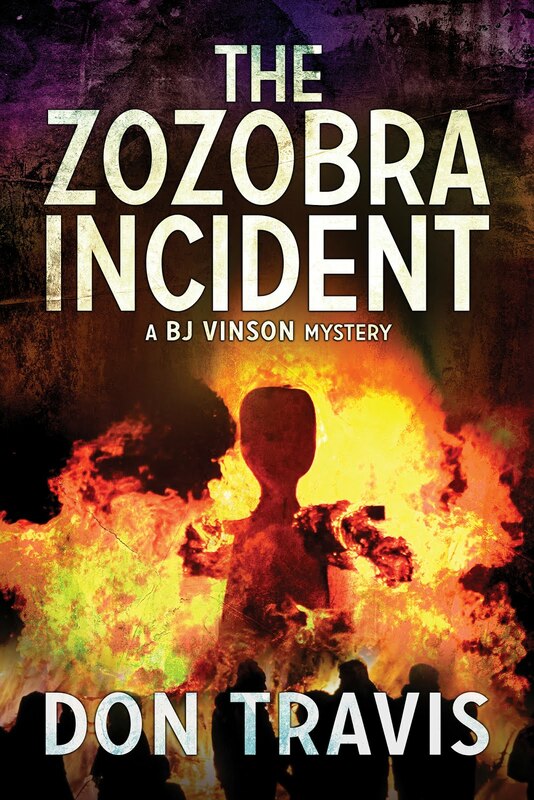 The Bisti/De-Na-Zin Wilderness area south of Farmington is central to the second book in my BJ Vinson mystery series, which features New Mexico as one of the major players. 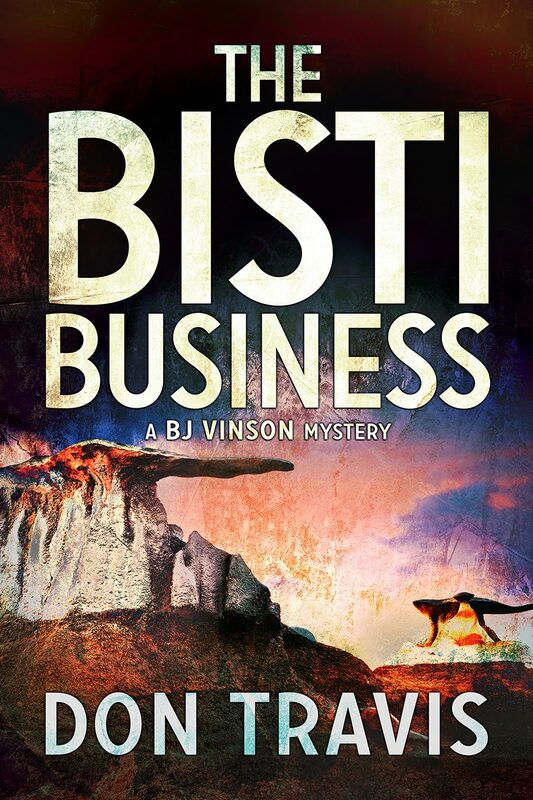 The opening scene of The Bisti Business (Martin Brown Publishers) take place there. wilderness from government brochures and a few other sources. Seventy million years ago, the Western Interior Seaway covered much of New Mexico. 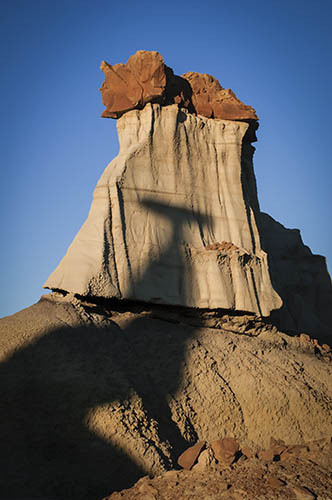 The area that includes the Bisti/D-Na-Zin Wilderness was once a riverine delta that lay just west of that ancient sea. Water built up layers of sediment. Swamps and ponds bordering the stream left organic material. Volcanic activity deposited ash, which was washed away by the river. As the water receded, the area became the home of prehistoric reptiles, large dinosaurs, and small primitive mammals that fed on one another and on the lush foliage along the riverbanks. Fish and turtles lived in the water. There is ample proof of this from fossils in the lignite sediment. Ancient mangrove forests rose and fell and left behind petrified remains. The two major geological formations in the wilderness are the Fruitland Formation and the Kirtland Shale. 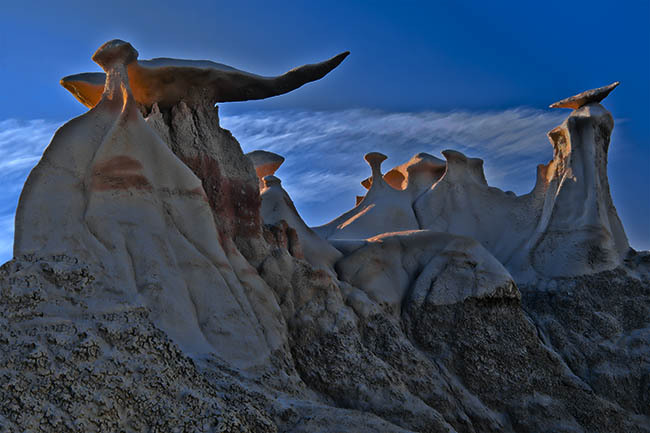 The strange rock formations and fossils are found in the Fruitland, and this is what most of the visitors of the area see on the western side of the badlands, the former Bisti Wilderness. Hoodoos and spires and sandstone formations dominate the area. It is mostly a world of gray ash black and red cinders from coal burned in an ancient fire that lasted centuries. Clay laid over the burning coal layer formed “clinkers” that look like small pottery shards. Kirtland Shale dominates the eastern side of the wilderness area (formerly known as the De-Na-Zin Wilderness). This formation contains rocks of many various colors, and is less traveled than the western area. In 1966, the United States Congress merged the two separate wilderness areas into a single unit in San Juan County, New Mexico. 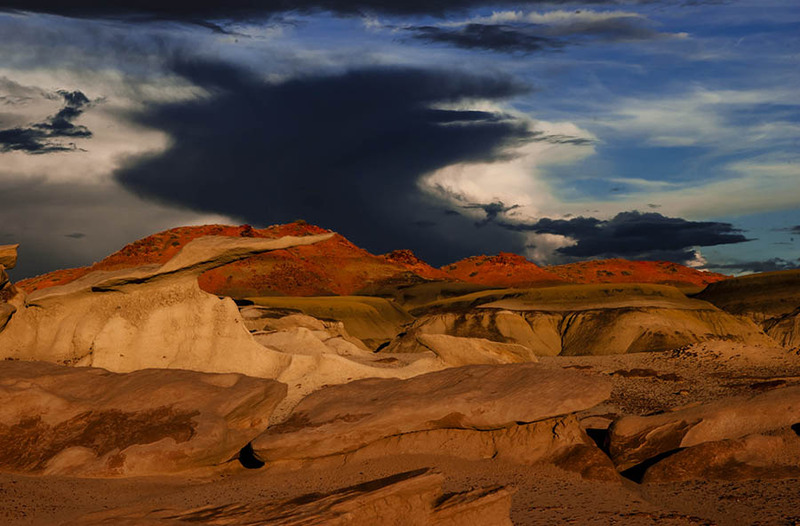 The merging of the Bisti Wilderness and De-Na-Zin Wilderness placed all 45,000 acres all under the management of the Bureau of Land Management, except for three parcels of private Navajo land contained within its boundaries. As the novel indicates, access (south from Farmington and north of Crownpoint) is rather limited, requiring some travel over unpaved roads. The area is not staffed by Bureau personnel, and there are no amenities. Water and food must be hauled in and rubbish carried out. The removal of fossils, including petrified wood pieces, is against the law. There are no established trails, so the tourist is pretty much left on his or her own. 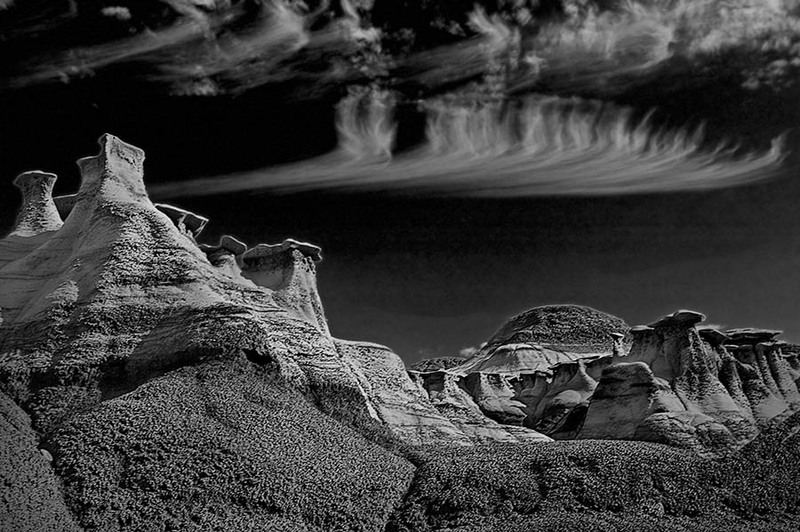 The following scene in Chapter 12 (beginning on Page 99) is BJ’s first exposure to the badlands. The Aggie with him is the older brother of one of the men the private investigator is searching for, Lando Alfano. Let’s watch and listen. About forty miles south of Farmington, Aggie and I turned off of Highway 371 onto a gravel road, which looped back north. Six miles later, we parked on a stretch of ground that faintly resembled a parking lot near a bunch of tumbledown, rotting buildings. There were no other vehicles in sight. In fact, we appeared to be the only two people on the planet. “You sure this is the right place?” Aggie climbed out of the car and looked around. stumps, washes filled with wacky shapes, and the silent menacing hoodoos towering uncertainly over us. In one moment, our surroundings were whimsical; in another, ominous. The Navajo considered this sacred ground, and I could understand why. We trod forbidden territory, or at least that’s the way it felt. There were no footprints in the dry washes or anywhere on the stony ground we traveled, and I felt ours would disappear with our passing, as if we walked an alien planet subject to different natural laws., I glanced behind me to check and took false comfort when I saw my shoe prints still existed. We had barely started our trek, and already sweat was staining my shirt. Following Dix’s hand-sketched map, we plodded on, taking frequent gulps of rapidly warming water, barely able to resist rushing off to explore some fascinating structural gem: thin spires of sandstone rising toward the sky like frozen tongues of flame, piles of mudstone carved by wind and water into ugly, fascinating gargoyles, specks of amber crystal winking in the hot sun, and those endless columns of sculpted, gravity defying capped rock. Eerie. Other-worldly, right? Felt that way to me. 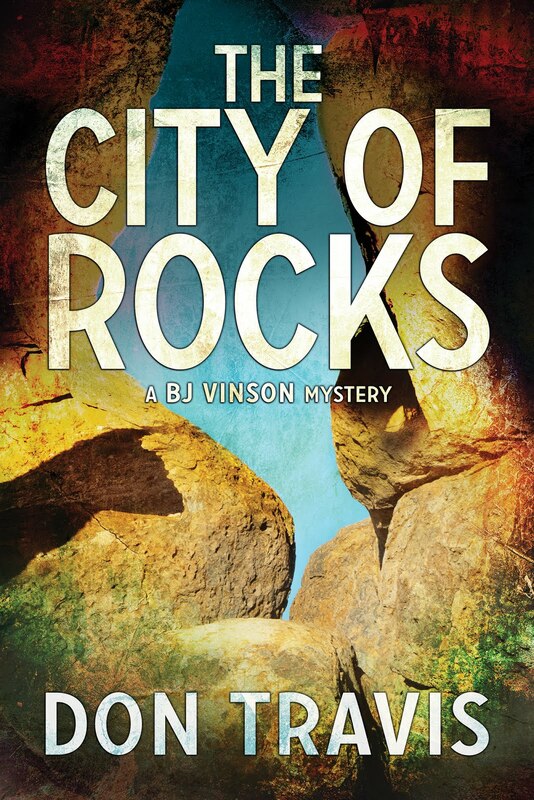 Further, it was a great setting for this mystery novel. A book featuring the Great State of New Mexico. Next week: Well, we finally got to Bisti. Next week? I have no idea. Wow! Those photographs are truly spectacular. Can't believe I still haven't made it up there to see the place for myself. Joe's photos are great. I can't get over how appropriate the first one is to the opening lines of the book.